Running at 47 is a completely different tale, than running at 15. My daughter Erin and I are similar in many ways — but one of us is Old school, and one of us is not. Go ahead…..take a guess. You will be right. O.L.D –> Diane. It’s OK, I can take it. Since the MIT grads haven’t invented the Time Machine (yet), I’m not especially fond of the alternative! She ran her Week 2, Day 1 of C25K on Saturday. Hooray!! She’s sticking with it, and I’m sooo happy. She’s doing terrific, and the more she does — the more her Vision for Herself grows. I should say, If I am home when she runs, I join her in “Spare ‘oom” and chat with her, encourage her as she runs. I help her adjust her speed upward. We’re still feeling out her capabilities, and getting her sea-legs on the treadmill. Once the weather breaks, we’ll both venture outside and run together. Single digits — ut uh, no outside. Not gonna do it. Anyway, as her confidence grows, her Vision grows. She talk about how she sees herself running the fitness challenges at school longer, and faster. How her gym teacher would be impressed. How she’ll feel proud by feeling stronger. Ohhh…she is Soo her Mother’s Daughter! Erin’s very familiar with my training schedule. She’s seen it tacked to our kitchen bulletin board for months as I was running my marathon plan. I’ve finally scanned it and attached it here. 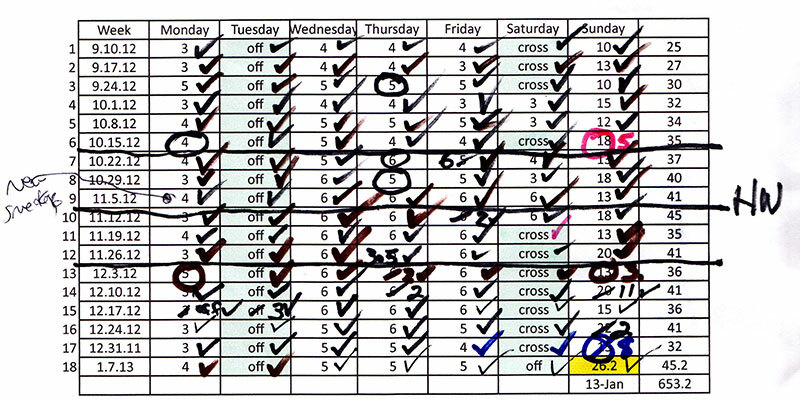 Oh it’s a marked-up mess…but every one of those checks is a symbol of pride and joy for me. The checks mean a completed run. DONE! BOO-YAH! A circle is a miss. A run I didn’t do, for one reason or another. Erin’s heard me talk about the Sheer Joy of walking up to that schedule, after putting in however many miles it was asking of me….pulling out my pen, and placing a glorious BOLD check mark next to the number. DONE! Ohhh god, it’s a moment of celebration. The monkey is off my back. Er, for the rest of the day, anyway…until the next day. So I offered to make Erin a schedule. Then I hung it up on the bulletin board, right next to my new Half Marathon schedule. But….what happened next….was funny. And very telling. Each day as I checked off my runs….I found myself checking off her runs too. WHAT? But Erin — you are missing the point. YOU are supposed to do the checking. So YOU get the “Moment of Sheer Joy”! I’m not supposed to be drinking down my joy AND your joy. She looked at me and said – “eh….I like the green dots“. Um, excuse me? Say what? She likes the green dots. ????? From there, my Erin proceeded to pull out her iPod Touch, and pull up the C25K app, and then I saw. Each day she ran…..Week 1, Day 1; then Week 1, Days 2 and 3; and then Week 2, Day 1 — once they were DONE — her app turned the little grey dot under the scroll bar — into a little green dot. Ahhhhh. I see says the blind mom. See I was worried that Erin was missing out on the “Moment of Sheer Joy”…..LOL, but Erin was receiving instantaneous Joy, the exact second she finished her run. The d@mn app gave it to her right then and there — handing out those green dots like candy. The really ironic part was …. that I started with the C25K app on my iPhone before I got the Garmin watch for Christmas…..and I never even noticed the stupid dots. Green or otherwise. And Erin is soooo New School. But Old School or New — we are both getting what we need to keep the momentum alive. The gratification of a job well done — whether by way of a (ahem) manual, pen-to-paper check mark — or a sweet, slick, sophisticated green dot….we’re receiving our gratification none-the-less. So, I’m going to stop checking Erin’s runs….um, because she doesn’t even look at the d@mn paper. LOL. And I’m getting all the gratification I need from Erin’s runs…just by watching her blossom in front of my eyes on the treadmill. Thanks for schooling your Old and Grody Mom, Erin. Old Dog, New Tricks. I love it, yo!